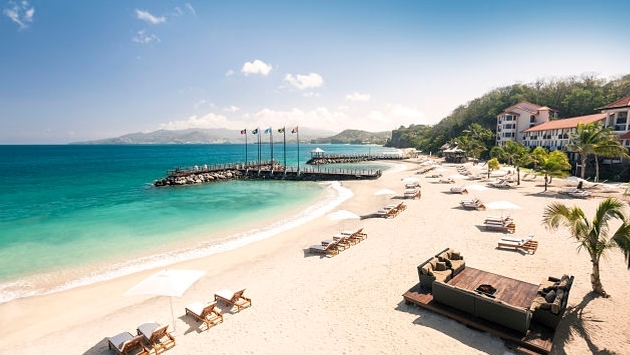 Located in the southeastern Caribbean, the gorgeous island of Grenada is home to the spectacular Luxury Included Sandals LaSource Grenada Resort & Spa — an all-inclusive unlike any other ever created. Nestled along the calming waters of Pink Gin Beach, this Six Star Diamond Award-winning resort boasts the perfect combination of chic elegance and tropical glamour. Here, you can indulge in a Caribbean hideaway with exceptional world-class amenities and the brand’s most elaborate accommodations to-date. The magnificent SkyPool Suites for instance, showcase exquisite details, including Carrara marble vanities, floors made of Turkish ivory stone and Italian porcelain planks, opulent private outdoor Tranquility Soaking Tubs for two, and stunning jaw-dropping plunge pools with an infinity edge that overlooks the ocean. Moreover, if you stay in top-level accommodations, you enjoy the added service of personal butlers trained by the world-renowned Guild of Professional English Butlers. Always attentive and never obtrusive, Sandals butlers maximize guests’ Luxury Included vacation by offering to unpack luggage, reserve beachside cabanas, arrange dinner reservations and set up in-room spa treatments on their behalf. At Sandals Resorts, food is a pivotal vacation component. Using only the freshest ingredients, world-class chefs create flavorful specialties from around the globe at the resort’s 10 delectable restaurants. With Sandals 5-Star Global Gourmet dining program, you embark on a daily epicurean journey featuring exquisite dishes that are always included and unlimited. As for diversions, Sandals LaSource Grenada offers a multitude of unlimited land and water sports. From volleyball to life-size chess and a state-of-the-art fitness center to five stunning pools, glass bottom boat tours and scuba diving for certified divers, there is an activity for every lifestyle. So if you’re looking for an incredible romantic end of the year getaway featuring worldly luxuries and surreal settings, add Sandals LaSource Grenada Resort & Spa to your holiday wish list. Writer, globetrotter, cheese-lover and perpetual kid-at-heart.